Welcome to a new week at historicpca.blogspot.com. Tech gremlins not withstanding, yours truly is finally presenting the post that got pre-empted by last week's breaking current events: the current iteration of the Los Angeles County Art Museum's $600 million makeover. In short, goodbye black blob, no more piece of bubblegum dog straddling Wilshire Boulevard, and say hello to the Inca temple. 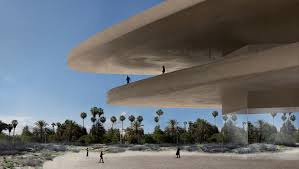 In his recent Los Angeles Times commentary on the ongoing design process, "Here are the latest designs for LACMA's $600 million makeover, Christopher Hawthorne presents the latest scheme for the Los Angeles County Art Museum. Never at a loss for poetic metaphors, LACMA Director Michael Govan and Swiss architect Peter Zumthor have pitched several schemes that Mr. Hawthorne describes as "...trying to seal the deal not so much with hard numbers as with poetic allusions that is sometimes inspiring and sometimes so much vapor." Well, yes, the pickups sticks scheme-an allusion to Chinese characters-was a good one. On Wednesday April 5, 2017, before a capacity house at the Museum's Bing Theater and in a long conversation earlier that day, both Messrs. Govan and Zumthor presented major revisions to the design. Mr. Hawthorne observed, "As always it was just the two of them onstage, with no space for curators or artists or time for questions from the audience." The urban context of the design has barely changed-"the massive new wing will still bridge Wilshire Boulevard, touching down on a piece of land the museums owns at the corners of Wilshire and Spaulding Avenue." Otherwise, the current iteration vastly departs from previous schemes. 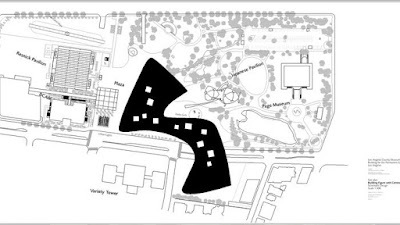 Plans for LACMA's makeover began life as black organic form (Black Flower or Blob, depending on who you talk to) spreading across the Miracle Mile site, an homage to the La Brea Tar Pits. The current version is less organic, less snarky comment inducing, and more hard-edge, muscular, sand color concrete. Less, "oozing oil-slick, " resembling Mr. Zumthor's 2007 Kolumba Museum in Cologne, Germany. Typically, Messrs. Govan and Zumthor-the latter in particular-portray the changes in near mythic language. Leaving the nuts and bolts of the project to the architects and engineers at project collaborators Skidmore, Owings, & Merrill. Peter Zumthor functions on a more elevated rhetorical plane. The moment I had to cross Wilshire I had to develop a different kind of urban energy...I couldn't cross Wilshire Boulevard with that organic, peaceful form. It took me a while to sort of let go of the baby...But I think I've figured it out. I"m happy. It's less slick and more substantial. Elemental. If I'm lucky the building the building will be like some kind of an Inca temple that's always been in the sand and now they've excavated it-a really old piece that's always been there. 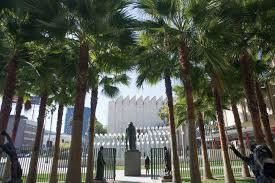 Mr. Hawthorne thoughtfully reminded Mr. Zumthor of Frank Lloyd Wright's work in Los Angeles. 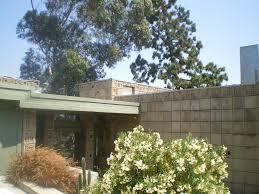 Specifically his four concrete block houses he designed in the 1920s with a similar effect. In the cases of the Wright houses, they were inspired by pre-Columbine architecture and made from sand-colored concrete. Personal note: they are extremely heavy to lift and very rough textured. The Swiss architect pondered this comment. Mr. Hawthorne noted, "The comparison must have appealed to him, because during the public lecture he referred to Wright's L.A. designs in concrete as the kind of thing he hoped to achieved." Apparently, the allusion to the modern master stuck with Mr. Zumthor because he hopes that the current iteration of LACMA might appear to have always been there and right in step with FLW's goals for Los Angeles, where he attempted to find a "timeless, indigenous, architecture as a counterpart to the flashy, richly decorated Spanish Colonial Revival buildings that were going up all over the city in the 1920s." The change in color is simply a matter of cladding the exterior in tan concrete instead of black (or dark concrete) concrete. 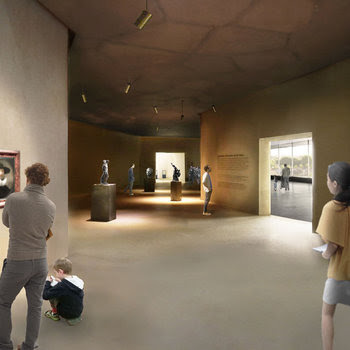 The tan color exterior will now match the walls inside the galleries, thus "creating an enveloping and monolithic architectural experience, as is the case at Kolumba." True enough statement. 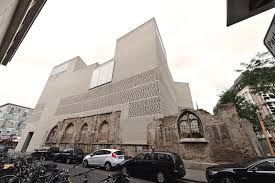 Both Michael Govan and Peter Zumthor declared their admiration for the color of Texas limestone on the exterior of the next-door-neighbor May Company building, future home to the Academy of Motion Pictures and Sciences museum. The building, designed by Albert C. Martin, Sr., also inspired the material palette of the two Renzo Piano buildings: the Broad Contemporary Art Museum and the Resnick Pavilion. It also bears close resembles to the the color of the William Pereira buildings the museum plans to demolish to make way for the new wing. 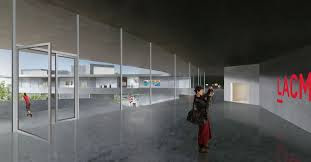 As was the case in previous presentations, Mr. Zumthor's latest images showed the galleries where a handful of galleries and seemingly randomly scattered artwork was visible. 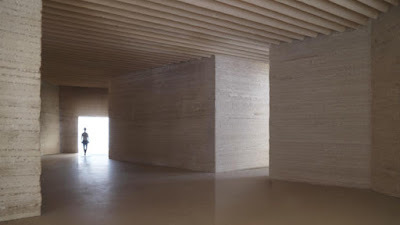 Mr. Hawthorne writes, "How the interior will look when it included a denser display of art-and cases, wall text and other practical additions that Zumthor nearly always leaves out of these rather gauzy images-remains to be seen." The April presentation did give a clear and developed idea of how the galleries will be laid out and how the building will touch down on either side of Wilshire Boulevard. Christopher Hawthorne reports, "Seven thick legs, or cores, will hold up the gallery live, lifted above ground and sandwich between horizontal concrete plates. The upper plate will be larger than the lower one, creating a deep overhang and helping shade the galleries inside." 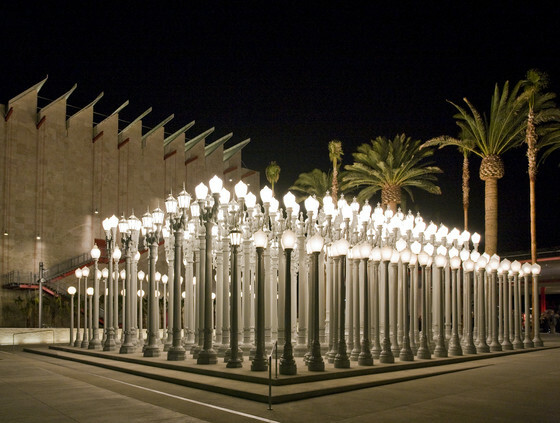 "Six of the cores will be located north of Wilshire Boulevard, on LACMA. The seventh, holding the museum's new theater, will be on the Spaulding site, allowing the building to span the boulevard. Two main staircases will lead up to the galleries, one on the northern edge of the building and one one on the Spaulding side." 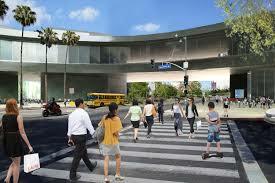 "Two of the core north of Wilshire will include ground-level galleries. 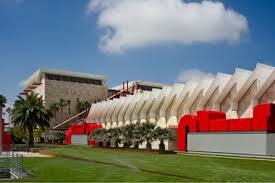 Another, facing BCAM, will hold a restaurant." The interior of the main level will feature four types of galleries. Lining the perimeter of the S-shaped structure will be "meander galleries, with floor-to-ceiling glass on the exterior side and artwork along the interior." The spaces, which vary in depth some wide and some more intimate, will double the circulation; in certain respects the success or failure of the building will center on how they turn out. This may feel like an exciting amalgam of gallery, public space, and viewing platform to observe Wilshire from above. On the other hand, it circulation space could suggest a "crowded hallway where some are has been stashed for lack of proper space elsewhere." The three other gallery-types will be housed inside the cores, shooting upward, vertically through the building. Small "cluster" and smaller "pocket" galleries will yield to bigger taller "tower" galleries that will flood the space with natural light via "high, hidden clerestory windows. (Seen from the sidewalk or plaza level the museum will resemble a long, horizontal form with the tower galleries poking through roofline like chimneys.)" One noticeable difference from the previous schemes,"the pocket galleries have a ceiling of folded, or pleated, concrete forms." The combination of scale and lighting conditions-"side light in the meander galleries, electric light in the pocket galleries and sunlight filtered through the clerestories in the towers-is the for Govan and Zumthor a key to the design." Peter Zumthor is working with artist Robert Irwin, who already installed a palm garden to the museum campus, and the office of landscape architects Olin." The important thing is all the green grass has to go...Shrubs, chaparral, desert grasses and colored mosaics on the plaza. A prudent idea-replacing the sprawling grass lawn with more geographically-specific and drought resistant landscape. The revisions to the plan, are hopeful in a number of ways, cannot alter the fact "that the design lost something fundamental when Govan made the decision to turn the building into a bridge spanning Wilshire Boulevard." 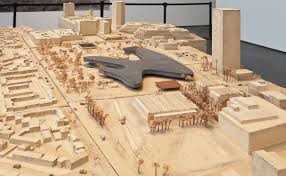 This decision was made after museum campus-mate George C. Page Museum complained that the proposed Zumthor plan was too close to the tar pits and needed to step back from the edges. To compensate for the los square footage without compromising the proposed relentlessly horizontal scheme, Michael Govan decided the building should cross the road to the Spaulding site. The result is a piece of architecture "that has a powerful relationship with the tar pits and existed entirely within a par setting, detach from the life of the street, was suddenly a kind of overpass looming over the boulevard." Mr. Zumthor describes the new scheme as possessing a "timeless or even primordial quality, something that's always been there." If you pay close attention to the current version, you can identify the ways it is formed by the way it crosses a busy boulevard, not timeless or something that has always been there, rather a product of contemporary urbanism. Six of the cores are bundled on the north side of the campus because, no surprise, you cannot put one in the middle of Wilshire Boulevard. Thank you for a statement of the obvious. Michael Govan enthused to the capacity crowd in Bing Theater "that the building is a daring one because it's willing to break the city grid by leapfrogging the boulevard." Be that as it may, the current version of Peter Zumthor suggests that the grid might have the last word.